EDIT: I just stumbled onto the source of these pictures. 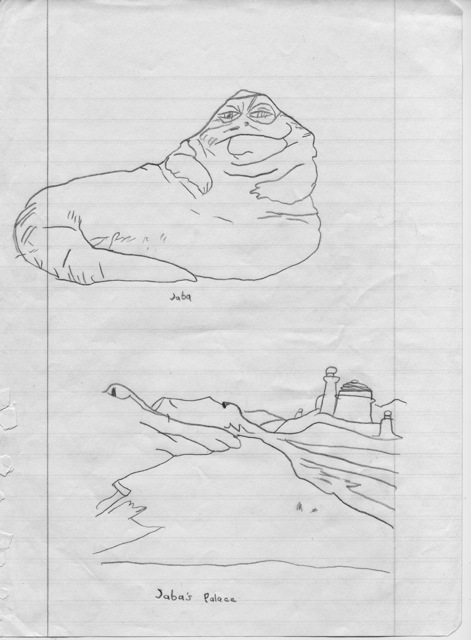 Although I don’t remember having this book, the Jabba I drew is an exact match for the Jabba on the cover of “How to Draw Star Wars Heroes, Creatures, Spaceships, and Other fantastic Things,” by Lee J. Ames. It may be that I was just following the instructions in the book, rather than tracing as I had assumed as first. I may have to see if I can get a copy of this.